CASE & CASEBACK: Very solid 3-piece steel case with pressure fit steel bezel and screw in case back measures 40 mm wide not including crown x app. 48 mm long x app. 12 mm high. There are only minor marks from wear and a few minor scratches. The lugs show minor wear and are very thick. The case back has minor marks from wear. I think the watch was never polished. Overall very good vintage condition. The bezel looks very good with some minor blemishes. Excellent condition, turns freely. 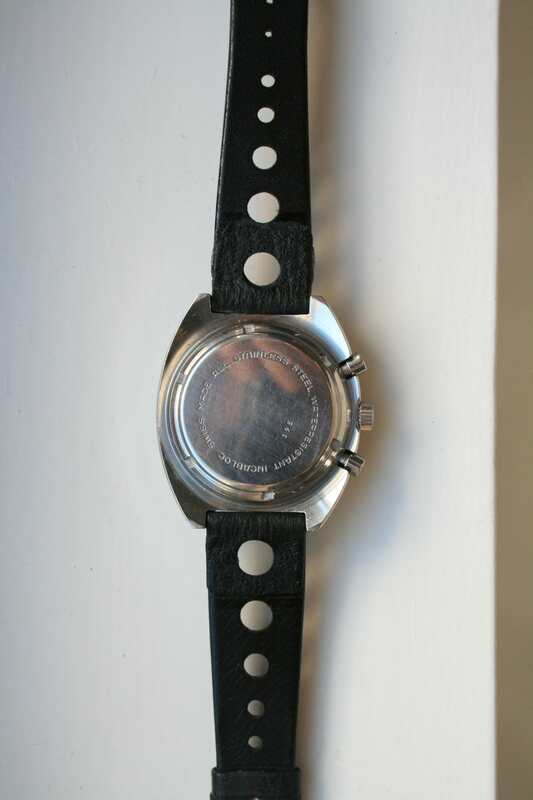 The outer back is marked ‘swiss made – all stainless steel - waterresistant – incabloc’ and is further marked with ‘395’. The original polish is still very well visible. DIAL & HANDS: Extremely nice and original silver dial with beautiful silver and black on raised markers with puffy lume on the outer ends. 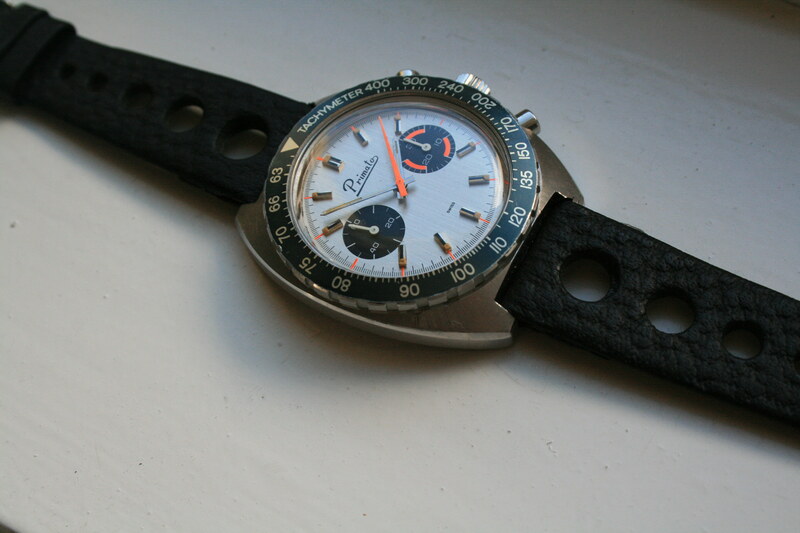 All original dial text in black is crisp and legible. Above 6 o’clock marker: swiss. Hands in perfect condition and matching lume on dial. 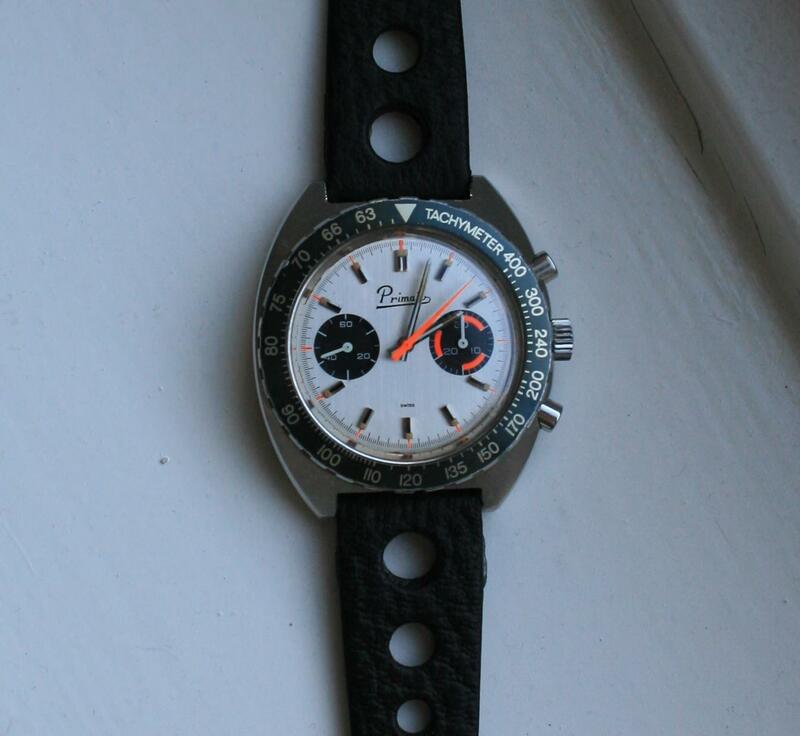 2 sub dials: a black one with white print at 9 o’clock and a black one with bright orange accents at 3 o’clock. The seconds hands is bright orange. CROWN & PUSHERS: Unmarked crown and pushers in very nice condition. CRYSTAL: Plexi without any major scratches. MOVEMENT: Powering this watch is a manual wound Valjoux 7733 movement. No service history known and squeaks a bit when wound. I have not timed it to the second but runs well and chrono function works. Given the age of the watch I will not guarantee the waterproofness of the watch. A service may be considered. STRAP: Hardly used period correct tropic strap. Stainless steel buckle marked with inscription of a dolphin(?) jumping out of the water. This watch has a lug width of 20mm. ASKING PRICE: EUR 1.950, which includes fully insured worldwide shipping by registered mail. FURTHER REMARKS: Given that I am raising money for a business venture no trades please. Payment in euro. Bank wire strongly preferred. Paypal to be discussed but you pay fees. Personal delivery within reason. I have dozens of feedback on various watch forums and about 200 on ebay (as Mark020). Watch and me are in the Netherlands. If required contact via phone/whatsapp/insta(Markk020)/Linkedin possible.